People tell me that kodomo animes(animes for kids) are lack of good story, good animation, and enjoyment. I really can't understand what do they mean. There are lots of kodomo anime with good story, animation, and give people a great time. 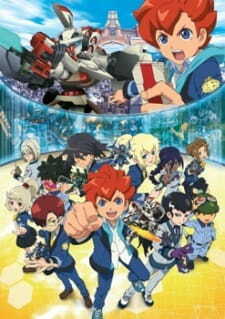 And Danball Senki Wars is one of those show, a really hidden valuable show which is (at least in my opinion) is better than most other kodomo animes, and even some mature animes. This anime is probably one of the best for character developement for lots of character. Arata got changes quite much through out the story, from a reckless LBX player, to a more calm and careful. We got to know his other sides too, he doesn't mind the borders between countries, and wants to make friend with everyone. He is confindent, but has doubt of himself too. We will later know that he don't want to use a great power like Overload, he just want "himself", which means he wants to achive without cheating help(Overload is so cheating power! ), something not everone can, huh? DBW developes other character too. Haruki, regreted for his mistake and had bad feeling for Violet Devil(it seem so, learned to let go. Hikaru, used to trust no one but himself and care for no one, had trusted his friends and cared for others. Everyone gets a developement so we will like them more, even the mastermind is not hateable, he just a good person with great purpose, only seems to be misguided. The art is good, I wonder why would a lot of people has watched this anime say no. The design for the character, perhaps not as good as more popular animes, but Danball Senki Wars has the most unique. Everyone is carefulled-design, even background characters, and they are cool in their own way. The LBX designs are all good, although a few is kind of weird. My favorite one is Dot Blastrizer in Raganok Phase form, it's even cooler than several Gundams :). The background, esspecially the Grand Master's room is good too. The music, ah, is the second best thing about this anime. Background music played through out the series suits the situation a lot. The first opening song, is a upbeat, joyful. But when the second one came, when things got serious, the tone changed completely, into a serious tone. So suitable with the story, huh? The ending songs are great, especilally Bokutachi No Wars(my favorite song of DBW). My only problem is the first ending, that song is quite annoying! But everything else about music is great. Overall, this is a very good show. It has a lot of deepth, good music, good art, good character. I think it deserves more popularity. This is one of those children Anime that, despite its "for children" tag, is actually pretty fascinating and can get surprisingly dark to some point of the story. Compared to the precentors, WARS clearly have its storyboard more well-written and is made more serious, and has a better grasp at its speed. however they will be considered as killed in action and will be kicked out from the school should the LBX be obliterated instead (outright exploding), hence the students must be aware of their condition and not get reckless. Because it's a children Anime but the producers decided to make LBX more than just some dangerous toy, they successfully filled in the hole such that the LBX be used more seriously and their full power can be demonstrated safely, while creating a war-like atmosphere without having people actually dying and injured badly, AND making them more relatable to children. Despite the childish nature of the Anime, the show does make the story settings plausible by describing the harshness of this virtual battle field, and how things will turn out should a player be KIA, as if it is a true war. The storytelling doesn't feel rushed (except during the later chapters), things are logical and the cliffhangers are pretty well done, which is something lacked in the older Danball Senki series. However things turned super serious when the main antagonists are introduced and showed their true intent - from this point on, the story feels nothing like a children Anime, but more like an adult Anime under the Inazuma 11 coat. Bodies appear, people WILL die, and children which are barely more than 12 is threatened and psychologically tortured. I mean, wow Level 5 what are you smoking? Not like this is bad (if it is even bad in the first place), but seriously? You introduced such hard crap into a children Anime where nobody saw it coming at all? Most people wondered that if the production group of Inazuma 11 has merged with Danball Senki, causing the massive changes in character art styles, due to their cartoon-ish hairstyles and faces. Arata is especially always joking referred as the protagonist from Inazuma 11 Go (which, interestingly, is introduced into the 3DS game as an additional character). This is probably the only downside of the anime as it is meant to be serious instead of being goofy and over-the-top like Inazuma. The LBX designs are, however, very well-done, as they were designed with "actual war machines/soldiers" in mind, instead of being just for recreational use. such as the DC series (the GM equivalent) and the Russian soldiers (Gunthers, in technoabble). All LBX that have two eyes are given visible "eyes" in order to make them more intimidating and show they meant buisness. Although arguably the successor of Dot Phasor, Dot Blastrizer and the big bad's LBX returned to the Super-Robot like state of Danball Senki W (even though they are nowhere nearly as broken as O-Legion - that thing literally ripped right through a navy fleet and suffered absolutely no damage from a ton of missiles), most of the cast maintained their status as a real-robot resembling machine, and all look as cool as hell. The background is basically what you'd expect from a typical Japanese Anime that doesn't lack funding. A large amount of the female cast has pretty large breasts, even students. I mean, they aren't even 15 years old, aren't they...? The music blends in very well with the generally light-hearted school life, yet they also did work with the more serious, military-like atmosphere. Even during the later parts when the storyboard suddenly goes super dark the composers managed to get it real nice and in place. The OPs made by Little Blue boX, Mugen Myself (My infinity) and Eternal, suits both atmospheres really well - during the light hearted stages of the story, the music is a happy, cheerful song describing the life in school, but when things get more serious, Eternal kicks in and sounds so tough and dank instead, signifying things from now on will no longer be simple and innocent as it originally seemed to be. This is probably the weaker side of WARS. The characters are sorta cliche, but they still work well in a children's Anime. Arata is a typical hot-headed leader who doesn't think before he does things or picks the (seemingly) less logical way to deal with trouble. However, he is actually smarter than he looked like, and later as he discovered a new ability hidden within himself, he faltered and is confused due to both the beneficial and harmful effects this ability can bring onto him, and yet he decided to tough it out in order to protect his team. Hikaru and Haruki (these two's names are basically just a re-spell of their Romanji...) are both cooler and logical, with the former being afraid of being surpassed by the seemingly just-lucky Arata and suffered a PTSD midways, while the latter is the big daddy of the team and will fiercely protect his teammates in order not to lose them. Sadly, these characters are not described throughout enough, as most of the time is focused on Arata instead of their development, and Hikaru's development is pretty rushed. Yuno, despite being the true female protagonist, suffered similar problems as the former two supporting cast, as she barely had any screen time, similar to Marina Ismail from Gundam 00 where she had nearly no importance in the story despite being the protagonist. The bad guys, surprisingly are more well-described and sometimes can be outright terrifying, containing elements that shouldn't be in a kid's show. Who doesn't love a through-out war between robots and see how they bash against each other in a more realistic way (covering fire, melee battling), and see how the protagonists go NT-D and rip through a whole supposedly threateningly powerful fleet single-handily? Level 5 seemed to be more aware of the battling scenes and decided to make it more plausible and interesting to watch at, not only they received an animation bump, they also have better staging and screening. This show is one of the lost gems that sunk into the vast amount of Animes because of its "for children" tag. If you are a huge fan of robots, you'd gotta watch this, even though the art style might be too childish for you. Danball Senki Wars's targets are kids so no wonder that there aren't many people are watching this. However, it's truly a hidden gem that actually has a nice story and deveplopment. For the story, I give 9. The story starts off very simple: a hot-blooded boy who has a big dream of becoming a pro LBXs player goes to the school and meets his friends. It's very kiddy, but at the same time, you can feel the competition inside the school and its seriousness. It really gives off an armosphere that they are really in War. However, after a douze of episodes, the story starts changing slowly and slowly. Many secrets are revealed, the antagonists appear." What is the purpose of the Second World?" is the biggest question of the series. They start with a simple reason: a simulation to research the method of keeping peace. As the story goes on, the reason changes: To actually keep peace in the real world. Then, many doubts are going on and now it's revealed that they actually use humans to research and make the Second World. Doubts, betrayals and wars are not usually seen in Kid shows, but DBW isn't affraid to put them in its story. The art, like any other kid shows, is not good. The background is very nice, but the characters sometimes are being drawn carelessly. However, the characters' designs are unique and you can easily recognize who with who. The sound is really nice. The first opening is really tuny and cheery, just like its fun start. The second opening suddenly changes its tone and it's perfectly fit with the situation they are in. The background songs are unique, especially its battle theme. The second ending, which has 3 main characters sing together, is really gentle and beautiful; it's like you can totally feel their emotion and their dream of peace. As I say before, the characters are really unique, they have different problems and strenght. Everyone in classroom, even the supporting characters have their time to shine. Arata, the main char, is deveploped well throughout the story. He is hot-blooded, but he still has fear inside him and he doubts himself. Hikaru starts off as an arrogant person, but he changes and believes in his team. Haruki has a fear and regret of the past, but he overcomes it and smiles more. You can't really hate any characters, even the antagonists, because they always give off a feeling that they are doing this for some reasons. Overall, this is a nice show to refresh yourself from those hard - complicated animes outside. You can enjoy its stupidness, but also enjoy the battle, the strategy and plot twists, not to mention the philosophy hidden in characters' lines (trust me, they are all over the place). It's simple, but not bad. Best kid show I have watched so far.